Mona Soliman MD*, Ahmed EL Kharbotly MD** and Ali Saafan Ph.D*** . *Assistant Professor, Dermatology unit, National Institute Of Laser Enhanced Sciences, Cairo University. ** Assistant Professor, ENT unit, National Institute Of Laser Enhanced Sciences, Cairo University. ***Lecturer, Medical &biological applications((Dentistry), National Institute Of Laser Enhanced Sciences, Cairo University . The present study was conducted on 25 patients suffering from persistent oral lichen planus (OLP). The cases were selected from the out patient clinic of the National Institute of Laser-Enhanced Sciences, Cairo University. OLP was diagnosed clinically and histologically. Patients were advised to stop any medications for treatment of OLP three months before laser treatment. Patients were treated by diode laser (980 nm) at the affected areas of oral mucous membrane with defocused mode until blanching of the treated area. Patients were followed up three days, one, two and four weeks after treatment to assess healing process and any postoperative complications. Patients were examined after six months for recurrence. No serious complications were recorded, apart from slight edema and pain. Complete healing occurred after the second week. After six months follow up, recurrence occurred only in three patients (12%). Diode laser (980nm) provides a marked clinical improvement without the need for neither local nor systemic treatment. Oral lichen planus (OLP) is a chronic inflammatory disease that causes bilateral white striations, papules, or plaques on buccal mucosa, tongue, and gingiva. Erythematic, erosions and blisters may or may not be present. About 50% of patients who have oral lichen planus also have skin lesions. Skin lesions in LP usually resolve within 1-2 years where in OLP it persists for 20 years or more . OLP affects approximately 1-2 % of the general adult population, all races can be affected and the female to male ratio is 1.4:1. 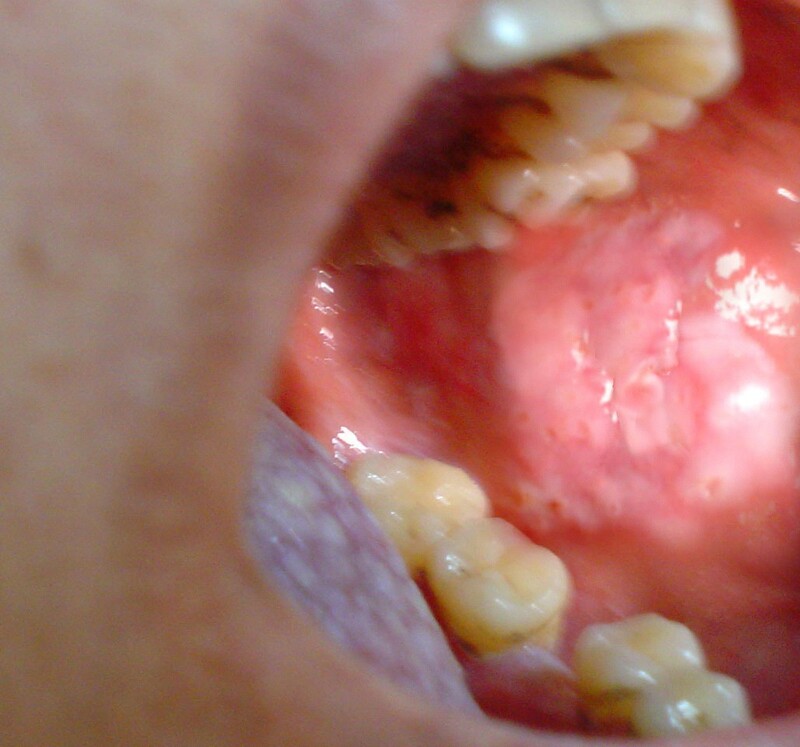 Complications of OLP include recurrence, super infection with candida albicans, and increase risk of oral squamous cell carcinoma, specially in atrophic and erosive lesions. The definite etiology of LP is still unknown, but it may be associated with other systemic diseases such as Diabetes Mellitus , Collagen disease, viral infections and emotional stress . Current data suggest that OLP is a T - cell mediated autoimmune disease in which autotoxic CD8+ T cells trigger apoptosis of the oral epithelial cells. The lymphocytic infiltrate in OLP is composed of T cells almost exclusively, and most T cells in the epithelium and adjacent to the damaged basal keratinocytes are activated CD8+ lymphocytes . The lichen planus antigen is unknown although, it may be a self-peptide, and in this case, lichen planus would be a true autoimmune disease. The role of autoimmunity in the pathogenesis is supported by many autoimmune features of OLP, including its chronicity, onset in adult, predilection for females, association with other autoimmune disease like alopecia areata, dermatomyositis, lichen sclerosus, morphea, myasthenia gravis, primary biliary cirrhosis, ulcerative colitis and vitiligo. Topical Corticosteroids promote healing of erosive areas, but do not eliminate reticular, papular or plaque like changes of lichen planus . Corticosteroids are used to reduce the submucosal lymphatic infiltrate and reduce inflammatory signs  but at the same time adverse side effects associated with steroids as candida overgrowth or even adrenocortical suppression may reduce its usage to minimum . Recently, there has been much excitement and controversy over the use of laser in medicine. Diode lasers provide great benefits over many other lasers because of its small size comparable to other types of laser. Diode laser also provides a wide range of spectrum that may be used in many medical fields ranging from physiotherapy, photodynamic therapy and surgical uses. Another important privilege of Diode laser, that it is transmitted through fibroptics so it can be used in different locations . Especially at the wavelength 980nm, the optical penetration depth seems to be smaller than the depth of penetration of 1.064 nm and higher than that of CO2. This physical benefit can be used effectively in the coagulation of superficial and interstitial lesions . Twenty-five patients aged 44-62 years (16 females and 9 males) with oral symptomatic lichen planus were enrolled in this study. Patients under any treatment were advised to stop treatment for at least 3 months before laser treatment. Women of childbearing age were excluded. Biopsies were taken before treatment as well as after complete healing. The site of the lesion was subjected to field block infiltration local anesthesia. The patient was advised to wear special eyeglasses for protection. All the staff wore the special glass goggles. The Diode laser is calibrated and measured to the desired power. The irradiated leasional area was selected by the aid of aiming pilot laser beam then was irradiated by 8-watt diode laser. The lesion was irradiated until the area changed to white color i.e. photocoagulation was completed. .
After surgery, the patients were instructed to put a piece of ice on the lesion to prevent severe edema. Patients were advised to use Oracure® gel postoperatively. 7-10 severe post operative complications. 4 90%-100% remission of signs and symptoms. 0 Little improvement or no change. Biopsy specimens were taken for histopathologic confirmation of the lesion before laser treatment. Specimens were fixed in 10% buffered formalin and embedded in paraffin. These sections were stained with hematoxylin and eosin. Patients were subjected to follow up for another 6 months one, two and four of recurrence. Of the 25 patients, two patients (8%) complained of moderate pain during the first 3 days following laser irradiation while the rest of the patients (92%) complained from mild pain. The pain disappeared by the end of the first week (Table 2). Edema occurred in all cases; after three days edema in the cheek was mild in 6 patients (24%), moderate in 12 patients (48%) and severe in 7 patients (28%). About 90% of severe edema occurred in patients who did not follow instructions after laser treatment. By the end of the first week edema was absent in 28%, mild in 48%, moderate in 16% and severe in 8% of cases. By the end of the second week, no sings of edema were detected or complained of by the patients (Table 3). Functional disorders occurred in some patients and were mainly in direct relation to the degree of pain and edema. In the first three days 8 patients (32%) suffered mild, 12 patients (48%) suffered moderate and 5 patients (20%) suffered sever functional limitations. After one week, with improvement of degree of pain and edema, 4 patients (16%) showed return to normal functions with no limitations that were mild in 15 (60%), moderate in 4 (16%) and severe in 2 (8%) patients. All the functions returned to normal at the end of the second week (Table 4). There was no postoperative bleeding or scar formation and the lased area was always soft on palpation. On subjective evaluation of clinical complications, according to (table 1), sixteen patients (64%) showed stage 4, four patients (16%) stage 3, three patients (12%) stage 2 and two patients (8%) showed no improvement (stage 1). During the six months follow up out of the 25 patients treated by Diode laser 980nm, three patients (12%) complained from recurrence that occurred after three months in 1 case and four months in 2 cases. No recurrence detected in the rest of cases. - = no , M= mild , MO = moderate , S = severe . 1: Cheek lesion before treatment; 2: Immediately after Diode laser treatment. 3: Two weeks after operation. 4: H & E section from the lesion before treatment; 5: H & E section from the lesion after treatment. Lichen planus is a relatively common dermatosis that occurs on skin and oral mucous membrane . The etiology of the disease is unknown, some authors state that it is a psychosomatic disorder caused by anxiety or stress . Steroids have been the drugs of choice in the treatment of this disease whether topical or systemic . Their hazards, side effects and contraindications are well known . Nonsteroidal anti-inflammatory drugs have been also used as an alternative to corticosteroids but with less beneficial results in addition to their known side effects. Surgical excision also has a place in the treatment of some cases as long standing erosive lesions . In addition, CO2 laser has been used for treatment of OLP . We tried to find out a new modality for management of OLP cases with minimum side effects .For superior control of the disease, pathogenesis of OLP should be taken into consideration. Cell mediated immunity to secondary antigenic changes in oral mucous membrane is thought to play a major role in its pathogenesis. Modified keratinocyte surface antigens are the primary targets for cytotoxic cellular response, where most cells and antigen-presenting langerhans cells seem to be the by key cellular elements in lesion progress. The T cells kill the target cell either by synthesis and extra cellular release of cytotoxic proteins as perforin and granzymes , producing pores in the target cell membrane and so kill cell by osmotic lysis ,or by stimulating the target cell, through mechanisms that are not well understood to undergo apoptosis. After killing, the activated T cells disengage from its target, but remain active and can kill again . Although corticosteroids are known to reduce the submucosal lymphocytic infiltrate and reduce the inflammatory reaction , it suppresses the immune reaction without removal of the causative factor that may cause the usual exacerbation on dose reduction. 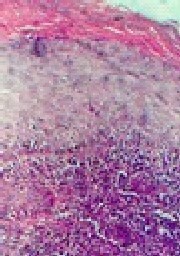 The best treatment should fulfill certain criteria as removal of epithelial cells that show signs of apoptosis and liquefactive necrosis from the site of the lesion, destroy keratinocyte surface antigens and autoantibodies as basal cell cytoplasmic autoantibodies and reduce the submucosal lymphocytic infiltrate . Corticosteroids, which are considered the most famous treatment, decrease the sings only by inhibition of the humoral immunity without removal of the causative factors. Surgical removal of some affected areas may be effective where the lesion is small and localized but in case of big lesions, it is very difficult specially with the very high possibility of occurrence in other sites. CO2 laser is considered as one of the earliest lasers used in medical field . The target of CO2 laser is water , and has a low power of penetration that reaches about 0.05 mm . It acts only superficially and removes the superficial layers of the affected area. The deeper layer of subepithelial connective tissue and lymphocytic layer cannot be reached by laser beam. In case of redeposition of surface antigen on the new formed surface epithelium, activated T-lymphocytes are ready to destroy their target. 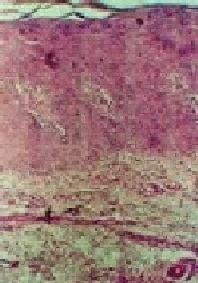 CO2 laser leaves a row connective tissue surface that may be the cause of prominent postoperative pain. Diode laser 980nm that possesses a deeper power of penetration reaching about 1.5mm . Application of diode 980 in 8w power in defocused continuous mode will rise temperature of affected tissues to above 50 degree and less than 100 degree; this temperature will cause protein denaturation . The sign of protein denaturation is the blanching of the treated mucosa. Denaturation of protein at the affected area means destruction of the diseased epithelium with its surface antigen. In addition, all the immune reaction components present in the range of diode laser treatment, as antigen antibodies, cytotoxic proteins and subepithelial lymphocytes, are all denaturated due to its deeper penetration. Denaturated protein acts as a dressing layer for the treatment site that may decrease pain, in comparison with CO2 laser, and enhance healing with less risk of secondary infection. Due to sealing of blood and lymph vessels, ice packs should be applied to the treated area, and in two patients (8%) who did not follow instructions, severe edema persisted until the end of the first week. The technique is very easy, fast, and safe. It could be done in outpatient clinic with local anesthesia. This modality satisfied the patients who suffered psychologically from the long treatment by corticosteroids and the fear and suffering from their side effects. In conclusion, Diode laser 980nm provides an alternative technique for treatment of OLP with marked clinical improvement as well as high degree of patient acceptance for this new modality of treatment. 1. Eisenberg E: Oral lichen planus: a benign lesion. J Oral Maxillofac Surg 2000 Nov; 58(1). 3. Scully C., El Korm M.: Lichen planus - review- and update on pathogenesis. J. Oral Pathol 1985; 14: 431 - 458. 4. Mc Cartan B.: Psychological factors associated with Oral Lichen planus. J. Oral Pathol. Med. 1995; 24: 273. 5. Porter SR, Kirby A, Olsen I, and Barrett W: Immunologic aspects of dermal and oral lichen planus review. Oral Surg Oral Med Oral Pathol Oral Radiol Endod 1997 Mar; 83 (3) 358-66.-8. 6. Silverman, S.; Gorsky, M.; and Giannotti, K.: A prospective study of findings and management in 214 patients with oral lichen planus. Oral Surge Oral Med Oral Path 1991; 72: 665. 7. Koch P and Bahmer FA: Oral lesions and symptoms related to metals used in dental restorations. Clinical, allergological and histological study. J.Am Dermatol 1999 Sep; 41(3pt1): 4-9. 8. Salah El-Din M.; Salah El-Din M and Ezz El-Arab A: Comparative study between CO2 laser and systemic steroid therapy in the management of oral Lichen Planus. A clinical and histopathological study. Egyptian Dental Journal 1997 July; 43: 2427. 9. Lozada F, Silverman S. Topically applied fluocinonide in an adhesive base in the treatment of oral vesiculo erosive diseases. Arch Dermatol 1980; 116: 898. 10. Voute, A., Schulten, E.; Langendijk, P.; Kastense, P. and Nander Wall, I.: Fluocinonide in an adhesive base for treatment of Oral Lichen planus. Oral Surge Oral Med Oral Pathol. 1993; 75:181. 11. Wray D, Mc Cord JF. Labial veneers in the management of desquamative gingivitis. Oral Surge Oral Med Oral Pathol 1987; 64: 141. 12. Moritz, A., Gutknecht, N., Doertbudak, O.Goharkhay, K., Schoop, U., Schauer, P. and Sperr, W. Bacterial reduction in periodontal pockets through irradiation with diode laser, A pilot study. J. Clin. Laser Med. Surg. 1997; 15: 33-37. 13. Romanos, G, Nentwig, G.: Diode laser (980 nm) in oral and maxillofacial surgical procedures: Clinical observations based on clinical applications. J. of clinical laser medicine and surgery 1999; Vol.17, No.5. 14. Warwick-Bown N.P., Marks N.J.: Turbinate surgery: how effective is it? A long-term assessment. ORL J. Otorhinolaryngol.Relat. Spec. 49:314-320, 1987. 15. Gorsky, M., Raviv, M.: Efficacy of entretinate (Tigasons) in symptomatic oral lichen planus. Oral Surg.Oral Med. Oral Path. 1992; 73:52-55. 16. Black MM, Lichen planus and lichenoid eruptions. In: Rock A., Wilkinson DS, Ebling FTG, Champion RH, Burton JL, eds. Textbook Of Dermatology. Fourth ed, chapter 42.Boston: Blackwell, 1986. 17. Allen CM, Beck FM, Rossie KM and Kaul TJ. Relation of stress and anxiety to oral lichen planus. Oral Surg Oral Med Oral Pathol, 1986; 61:44. 18. Lozada F., Silverman S .Topically applied fluocinonide in an adhesive base in the treatment of oral vesiculoerosive diseases .Arch Dermatol, 1980; 116:898. 19. Brightman VJ: Red and white lesions of the oral mucosa: in Burket’s Oral Medicine .Ninth edition JB Lippincott company, Philadelphia 1994, 51-120. 20. Boisnic, S.; Frances, C.; Branchet, M.; Szpirglas, H.and Le Charpentiez, Y.: Immunohistochemical study of oral lesions of lichen planus diagnostic and pathophysiologic aspects. Oral Surg Oral Med Oral Patho, 1990, 70:462-465. 21. Lamey, P.; McCartan, B.; Mac Dollald, D.and Mackie, R.: Basal cell cytoplasmic autoantibodies in oral lichenoid reactions. Oral Surg Oral Med Oral Radiol Endod, 1995, 79:44-49. 22. Pick, R.M. and Powel, L.G. : Lasers in dentistry, soft - tissue procedures. Dental Clinics of North America. , 1993, Vol .37, No. 2:281-297. 23. Payne , B.P. ; Nishioka , N.S. ; MikiC , .B.B. and Venugopalan , V. : Comparison of pulsed CO2 laser ablation at 10.6 m and 9.5 m. Lasers in Surgery and Medicine , 1998, 23 : 1-6. 24. Anderson, RR and Ross, EV: Laser-tissue interactions .In cosmetic laser surgery.Fitzpatrick, RE and Goldman, MP.Mosby, Inc, 2000, 1-15. 25. Catone GA, Halusic E: Photobiology of lasers in oral maxillofacial surgery .In Laser applications in oral and maxillofacial surgery. Catone GA and Alling, C. Saunders company 1997, 29-38. 26. L' Esperance, F.A. : Ophthalmic lasers. Third edition, chapter 1, pp. 1-10 .Churchill Livingston, Edinburgh and London, 1989.